I do not have a traditional God gene, calling me to attend a conventional church. Instead, I use Nature as my go-to place in which I explore and cleanse the Temple I’ve been given. I consciously pay homage to an unconditional outside environment and use it to find peace within my inner spaces. The specifics of the method, albeit analogy based, are accessible to any open mind. Through my visual system, I use oceans and rivers to envision the fluidity that bathes my spinal cord within my spinal column and my brain within my skull. I use nature’s wind as fuel to clear my lungs and nasal passages. The salty mist of the sea is my neti pot. I rely upon its effectiveness to clear my head, calm my mood, and simply feel better after each practice. And now, the scientific field seems to be lending credibility to my personal Church. Multiple studies are now revealing some fundamental motives why we are attracted to given vacation destinations. Simply observing nature scenes have lowered heart rate levels and stimulated positive parasympathetic regulation, lowering levels of stress hormones known to inhibit digestion.1 Memory and attention improved 20% after people spent even just an hour in nature.2 Taking a walk in nature reduced depression by 71%, while walking indoors in a mall reduced depression by 44%.3 Observing awe-inspiring nature scenes later demonstrated lower levels of cytokines, which means less risk of tissue damaging inflammation.4 Yet, perhaps we can take it one step further and turn to Dr. Nature to diagnose an imbalanced physical state. Regardless, the odds of opening up to potential benefits will increase after drawing correlations between the Earth’s biology and our own. Consider the fact that 96% of our bodies are made up of the same materials upon which nature is built: oxygen, hydrogen, carbon, and nitrogen. With the majority of our make-up being fluid based, circulation within our own bodies could be likened to the forces of oceans and streams, carrying gases that flow through mineral-enriched networks of our bony structure. These principles of equilibrium and fluidity that surround us within our natural environment creates a healthy platform for our bodies to continuously breakdown and rebuild themselves. We produce new bone from within by compounding calcium and small amounts of trace minerals with our blood stream. These same powerful, fluid forces dissolve waste build-up and wash away old bone, similar to streams that reshape rocky river beds. Instinctually we wish to immerse ourselves within this fluidity. What is even more satisfying than a daily shower or bath for some is immersion in nature’s bubbling hot springs, while for others it’s a polar bear style cold plunge. The reason some of us are drawn to one extreme or the other deserves personal consideration. Are some of us drawn to warmth as a method for releasing tight muscles while others instinctively crave a cooling effect for inflamed nerves in fresh water lakes? Could we strengthen dry, brittle bones by hiking through damp jungles? Can we clear dampness in our lungs by breathing in arid desert air? Getting in tune with these inherent qualities is accessible, even for lifestyles primarily lived within walls, ceilings, and unnatural structures. Before simply hugging a tree, you can relate to nature more effectively by stepping back and visually transplanting it’s biological structure within your body, either standing, sitting, or lying down. Begin by metaphorically planting your feet into the ground (preferably barefooted). You may feel the exposed soles of your feet respond by opening downwards with strength similar to actual roots that penetrate the soil. In your mind, begin to see the trunk as your spine and feel it’s initial seed as your pelvis while you open the spaces between your toes. Open your palms forward and as you exhale, squeeze your entire skeleton while your muscles naturally lengthen themselves by extending your legs downwards and your spine upwards. In any of these positions, translate the Earth’s natural forces into diverse tissues within your body. If you have an over-active digestive system, allow your consciousness to rest deeply within it while you gaze softly into still waters. Listen deeply for a pulse of your circulation when you close your eyes and place the sound of moving water into the tubes of your blood vessels. Perhaps thickened inner linings can be safely thinned with a soft yet constant trickling stream. These ideas are sustainable in the realm of Faith. If your body was meant to simply be a place where the Spirit lives, it would be a straightforward house or dwelling. 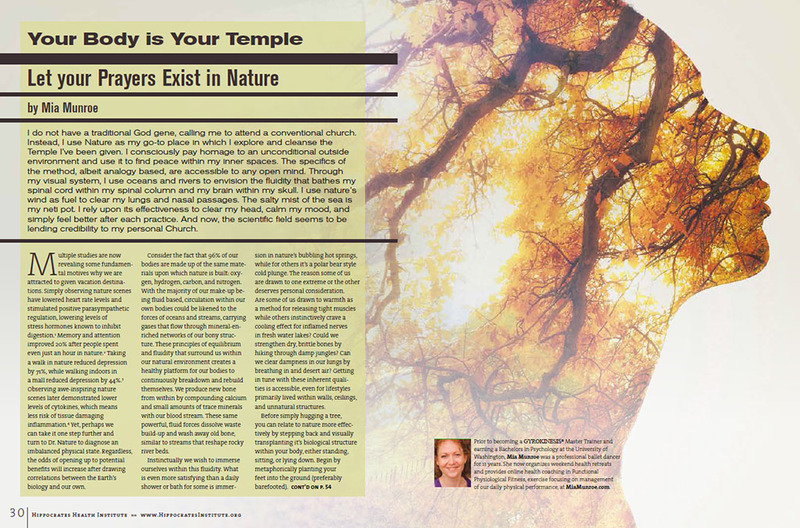 However, a Temple, like Nature, is a house of worship. Spend time sitting quietly and alert with Nature. Finding the will to consciously embody Nature will inevitably recover any lost sense of self-worth required to maintain a thriving Temple. It’s been observed that people with a strong connection to nature display psychological wellbeing, including satisfaction with life and feelings of social acceptance.6 As you breathe inwards, lift your chest to look upward and ponder your place in the universe. Perhaps Nature can lead you to this answer within yourself. 3. Ecotherapy — The Green Agenda for Mental Health. (2013) Retrieved April 15, 2015. 4. Stellar J.E., John-Henderson, N., Anderson, C.L., Gordon, A.M., Gordon, A.M., McNeil, G.D., Keltner, D. (2015) Positive affect and markers of inflammation: discrete positive emotions predict lower levels of inflammatory cytokines. Emotion 15(2) 129 – 133. doi: 10.1037/emo0000033.